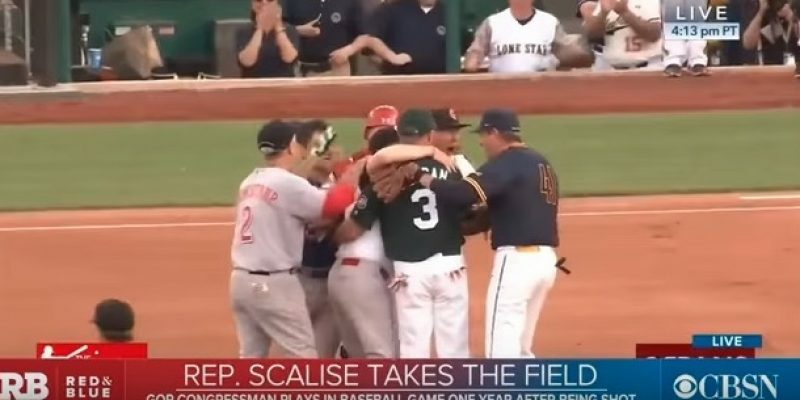 Last night at the annual Congressional Baseball Game for Charity, Majority Whip Steve Scalise returned to Second Base to where he was shot one year ago by a deranged shooter who opened fire on Republican players. The first pitch was hit directly to Scalise and although he’ll never be able to walk again without a limp, the Louisiana Republican made the play and made the first out by throwing to First Base. Scalise was mobbed by everyone on the infield with hugs and cheers. Scalise underwent nine surgeries over the last year and missed months of work in Congress. Several of the doctors at George Washington Hospital didn’t think he would make it through the night. In the days after he was shot, doctors said he was incredibly lucky to survive. The game is a long-standing tradition that raises money for a number of charities. Last year the game raised $1.5 million. This year, a portion of the proceeds will go to the United States Capitol Police Memorial Fund in gratitude to the officers who defended lawmakers last year. Were it not for Scalise’s security detail, Officers David Bailey and Crystal Griner, the shooting may have been much worse. The Democrats beat the Republicans 21 to 5.